As you’ll see, 43 out of the 68 teams that were in the tournament this year have committed major violations. That’s not a particularly surprising number given that it’s a relatively inbred group, with coaches jumping from school to school, often leaving a trail of NCAA violations in their wake. 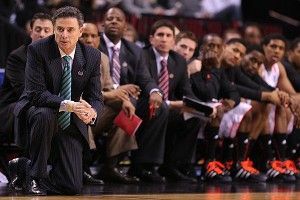 I was actually able to connect all 68 of the head coaches to either Rick Pitino (the prince of conduct unbecoming) or Jerry Tarkanian (the godfather of NCAA violations) in seven steps or fewer (and all but three in six steps or fewer). For example, Scott Nagy, the head coach at South Dakota State, was a graduate assistant with Lou Henson at Illinois; Tony Stubblefield was an assistant to Henson at New Mexico State; Stubblefield was an assistant coach with Mick Cronin at Cincinnati; and Cronin was an assistant with Pitino at Louisville. OK, to make it easier, here’s a fancy chart that diagrams all the connections. Here’s how the basketball programs stack up. Instead of ranking them by number, I’ve grouped schools by pop culture good guys and bad guys, starting with the innocent, then moving down to the very, very, very guilty. Here’s a key for Grantland’s NCAA compliance violations chart. The innocent — no major NCAA violations, and no major legal trouble. Coach Pat Knight uses phrases like “kids are stealing money by being on scholarship,” “tin men with no heart,” “I’ve never been around a team that’s got so many problems,” and “infestation of guys that are hard to coach.” He uses those words as a backbone of a life spent defending something. You use them as a punch line. No major violations, but still noteworthy. The Bluejays were sued by a former student-athlete who said Creighton recruited him despite knowing he was not educationally prepared to perform college coursework, and for failing to provide him any real access to its academic curriculum. Former coach Larry Eustachy taught everyone a lesson about the risks of kissing young women at college parties after losing to Missouri, and about adjusting privacy settings on Facebook. Before there was Bounty-Gate, there was Goon-Gate, when then-coach John Chaney put in seldom-used Temple forward Nehemiah Ingram to “send a message” to St. Joseph’s. Ingram broke a player’s arm on a hard foul and fouled out in four minutes. Major violations, but mostly forgotten or forgiven. Skip down to Duke for the good stuff. Findings of major violations in 1998. Violations: Failed to monitor recruiting funds, athletic director (and basketball coach) violated principles of ethical conduct and improperly deposited almost $200,000 of university funds in a private bank account that he had sole control over and destroyed most of the records of the account, lack of institutional control. Penalties: Four years of probation. Findings of major violations in 1966 and 1999. Violations: $4,000 in loans and other financial benefits provided to recruit. Penalties: One year of probation, 18 regular-season wins and one tournament win vacated. Finding of major violations in 1961. Violations: Providing entertainment and lodging to recruits and parents of students. Penalties: One postseason ban and one year of probation. Findings of major violations in 1961 and 1986. Violations: Inducements to recruits, extra benefits to players. Penalties: One-year postseason ban, two years of probation. Findings of major violations in 1984. Violations: Academic fraud, impermissible inducements to recruits. Penalties: One-year postseason and television ban, one year of probation, reduction in aid. Findings of major violations in 1977. Violations: Ineligible player played for team and received aid. Penalties: One-year postseason ban, forfeiture of wins from 1977 season. Findings of major violations in 1955. Violations: Booster club provided funds for entertainment and travel. Penalties: One year of probation. Findings of major violations in 1982. Violations: Improper benefits to recruits, lying during NCAA investigation. Findings of major violations in 1954. Violations: Booster clubs provided funds to recruits. Violations: Improper tryouts on campus. Findings of major violations in 2000. Violations: Booster employed non-qualifier students, impermissible lodging for recruits. Sweep the leg (or stomp the chest). If this were an irrational hatred contest, Duke would be national champion. But, with only one major violation (and that was in the 1970s), they’re on the innocent side of the violations spectrum. Yes, Corey Maggette admitted he accepted $2,000 from summer league coach Myron Piggie while in high school, and there are allegations that Chris Duhon’s mother and Carlos Boozer’s father were improperly given jobs by Duke boosters. But I could fill an entire column with questionable behavior that isn’t punished by the NCAA. Findings of major violations in 1972. Violations: Improper benefits for recruits, booster provided recruit with transportation and tickets for ACC tournament. Smaller schools, big violations, probably surrounded by a-holes. The Bonnies were hit with a major violation for using an ineligible player who had transferred from community college with a welding certificate instead of an associate’s degree. After learning that the NCAA had ruled the team ineligible to play in the Atlantic 10 tournament, the team boycotted the final two games of its regular season. Findings of major violations in 1968 and 2004. Violations: Participation of ineligible player, receipt of aid by ineligible player, lack of institutional control, unethical conduct. Penalties: Two postseason bans, four years of probation, reduction in aid and recruiting, 12 regular-season games vacated. Findings of major violations in 1973, 1974, and 1984. Violations: Cash and inducements to recruits, boosters run amok, lack of institutional control. Penalties: Two postseason bans, two television bans, four years of probation. Former coach Kelvin Sampson was sanctioned by the NCAA for more than 500 impermissible calls that were made to recruits while he was coach at Oklahoma. When Sampson got to Indiana, he and his assistants (and the team) were sanctioned for making impermissible phone calls to recruits while on probation for making impermissible calls to recruits. Findings of major violations in 2008. Violations: Impermissible phone calls to recruits, lying to NCAA investigators. Penalties: Three years of probation, reduction in aid and scholarships. Trying to kill the queen is kind of a big deal. Findings of major violations in 2011. Violations: Impermissible inducements to recruits, booster run amok, failure to monitor recruiting calls and texts. Penalties: Three years of probation, reduction in aid. Clean since the early 1980s, but Huggy Bear’s presence looms large. Findings of major violations in 1957, 1982, and 1983. Violations: Benefits to recruits, impermissible contact with recruits. Penalties: One year of probation and public reprimand. Mizzou coaches provided meals and transportation and had impermissible contact with recruits and their families. And Duke haters got to gloat that Quin Snyder lost his job. Findings of major violations in 1990 and 2004. Violations: Extra benefits to players and recruits, lack of institutional control. Penalties: One postseason ban, one television ban, five years of probation. No violations in the past 30 years, but two players were recently accused of sexual assault and subsequently suspended from the team. Findings of major violations in 1956 and 1982. Violations: Out-of-season practices, lying to investigators, impermissible inducements to recruits. Penalties: One postseason and television ban, one year of probation. A 2009 violation implicated 16 sports and the Crimson Tide’s failure to monitor the distribution of textbooks to student-athletes. (Apparently, some students did not put book covers on their hardcover textbooks.) As the co-author of a sports law textbook (shameless plug! ), I am outraged. As a sports fan, I am unmoved. Alabama has run into some trouble this year, however, suspending two players. Findings of major violations in 1999 and 2009. Violations: Extra benefits through textbook distribution program, exceeded phone call limit, attempts to obtain money from boosters for recruits. Penalties: Three years of probation. After years of paying recruits and falsifying transcripts, Wichita State managed to steer clear of any major violations for three decades. But they couldn’t avoid being sued by their own fans. In 2001, they were slapped with a lawsuit from an unhappy season-ticket holder who took issue with a priority points system for seats. Findings of major violations in 1956, 1963, 1974, and 1982. Violations: Cash to prospective student-athletes and falsification of transcripts. Penalties: Three postseason bans, five years of probation. Only one scandal, but New Mexico gets extra points for having a nickname for it — “Lobo-Gate.” Then-coach Norm Ellenberger and his assistants engaged in a smorgasbord of academic fraud, including forging academic transcripts and paying for phony junior college credits to keep players eligible. The NCAA found 57 rule violations and Ellenberger was later convicted of 21 counts of fraud. Findings of major violations in 1980. Violations: Tampering with academic records, academic fraud, cash from boosters, extra benefits to players. Penalties: Two-year television and postseason ban, three years of probation. Members of the basketball and football teams received special credit arrangements at The Shoe Box, a store in Black Earth, Wisconsin. Click here to tour the store. Findings of major violations in 1982, 1986, and 2001. Violations: Improper benefits, lack of institutional control, booster run amok. Penalties: Seven years of probation, all wins vacated from 1982 to 1984. Then-coach Norm Sloan engaged in unethical conduct and provided an airline ticket for ex-Florida star Vernon Maxwell in 1987. Sloan resigned amid a federal investigation into charges that he had filed false reports with the NCAA. He retired just days after Galen Hall, Florida’s football coach (who replaced Charley Pell, who was dismissed for NCAA violations), resigned after he admitted paying two former assistant coaches $22,000 in (improper) salary supplements. It was a really good year for Florida. Finding of major violations in 1962 and 1990. Violations: Benefits for recruits, knowingly allowing ineligible athletes to play. Penalties: One postseason ban, one-year television ban, two years of probation, and reduction in aid. I’m talking the remorseless, devious, “greed is good” guy from the 1987 original, not the old, soft, “I love my daughter” reincarnation from 2010. Findings of major violations in 1957, 1996, and 1998. Violations: Extra benefits to players and a booster run amok. Penalties: Two postseason bans, loss of scholarships, and seven years of probation. Widespread academic fraud in 2007 involving 61 athletes led the NCAA to strip Florida State of scholarships across 10 different teams and to vacate all wins in 2006 and 2007 that involved the implicated athletes. Not only that, but it turns out Sam Cassell stole his dance move from Major League 2. Findings of major violations in 1968, 1970, 1983, and 2009. Violations: Academic fraud, improper benefits to players and recruits, boosters run amok, lack of institutional control. Penalties: One postseason ban, one television ban, five years of probation, reduction of aid and recruiting, 22 wins vacated. Findings of major violations in 1957, 1960, 1972, 1988, and 2006. Violations: Improper benefits to players and players’ family, pay for work not performed, boosters run amok, lack of institutional control (twice). Penalties: Three postseason bans, one television ban, 10 years of probation, reduction of aid. Then-coach Jim O’Brien gave a $6,000 cash inducement to the family of a recruit in 1998 and failed to report the violation for more than five years. Another player was found to have received improper benefits and committed academic fraud, which led to three years of probation for Ohio State and forced the Buckeyes to vacate all wins and tournament money earned while the player was on the team. O’Brien was then fired, but fought back and won $2.4 million in a wrongful-termination lawsuit. Findings of major violations in 1957, 1994, and 2006. Violations: Cash payments to families of recruits, academic fraud, extra benefits (dental work!) to players, lack of institutional control, excessive contact with recruits. Penalties: Two postseason bans, one television ban, reduced aid, 76 regular-season wins and seven tournament wins vacated (including Final Four appearance in 1999), five years of probation. Findings of major violations in 1955, 1957, 1972, and 1989. Violations: Improper benefits to players and recruits, boosters run amok, lack of institutional control. Penalties: Four postseason bans, one television ban, eight years of probation, reduction of aid and recruiting. Jerry Tarkanian’s tenure at Long Beach State (1968-73) led to 23 NCAA rules violations. His spirit lived on through the 21st century, as the team allowed six transfers to play even though they were ineligible for admission to the university. There were also many reports of academic fraud, including one instance where an assistant coach forged the name of a proctor on a correspondence exam. Findings of major violations in 1974 and 2008. Violations: Academic fraud, improper benefits to transfer prospects, cash payments to players, and lack of institutional control. Penalties: Six years of probation, one postseason ban, one television ban, 18 regular-season and six tournament games vacated. Then-coach Todd Bozeman paid $30,000 to the parents of Cal guard Jelani Gardner in 1996. How’d we find out about the payments? Gardner’s dad came forward because he was upset about his son’s lack of playing time. Gardner transferred to Pepperdine, Bozeman was fired, and Cal was banned from postseason play for a year and forfeited its wins from Bozeman’s final two seasons. Findings of major violations in 1997 and 2011. Violations: Impermissible recruiting calls (many and major in nature), booster and coach cash payments to parents of players, coach provided misleading information to the NCAA, ineligible players played with coach’s knowledge. Penalties: Two postseason bans, seven years of probation, 28 regular-season wins vacated, eight-year “show cause” for head coach. Academic fraud in the mid-90s stripped New Mexico State of its NCAA tournament appearances from 1992-94. After Aggies coach Neil McCarthy was fired, he sued the school for wrongful termination, which meant additional violations were revealed, which meant additional sanctions were imposed. Findings of major violations in 1973, 1996, and 2001. Violations: Academic fraud, providing cash to prospective student-athletes, lying to recruits about eligibility. Penalties: Three postseason bans, one television ban, nine years of probation, reduction of aid and recruiting, 37 regular-season wins and seven tournament wins vacated. Ten members of the 1990 UNLV team were suspended at one point for an assortment of NCAA violations, and in the nine months leading up to the 1990 NCAA tournament, investigators visited the school 11 times, which is about 10 times more than the United Nations visited Iran’s nuclear plants. Ties to Richie “The Fixer” Perry, who was convicted of helping to orchestrate the Boston College point-shaving scheme in the late 1970s, eventually brought down the program and its coach, Jerry Tarkanian. In case you’re interested (and a little crazy), the negatives of the photos of three UNLV players sitting in a hot tub with Perry can be yours for a mere $2.6 million. Findings of major violations in 1977, 1993, and 2000. Violations: Cash to recruits and players, relationship with game-fixer, coach encouraged others not to cooperate with investigation, lack of institutional control. Penalties: Two postseason bans, two television bans, six years of probation. Michigan has only been hit once, but it has been hit hard. The NCAA found that four players (Chris Webber, Maurice Taylor, Robert “Tractor” Traylor, and Louis Bullock) received more than $600,000 from booster Ed Martin, who pleaded guilty to laundering money from an illegal gambling conspiracy. The NCAA vacated more than 100 wins, including the 1992 and 1993 Final Four appearances, and left then-coach Brian Ellerbe with an official record of 0-27 during his 1988 and 1989 seasons at Michigan. Findings of a major violation in 2003. Violations: Extra benefits to recruits valued at over $600,000. Penalties: Self-imposed postseason ban, four years of probation, vacation of 106 regular-season and eight tournament wins, reduction in aid. The greatest criminal mind of our time (the Gene Hackman version, of course). The Bob Huggins Era alone puts Cincinnati basketball in rarefied air. The NCAA hit Cincinnati with a host of penalties in 1998, after it found the program exhibited the dreaded “lack of institutional control,” marked by boosters paying players for jobs that didn’t really exist and providing other impermissible benefits to current and prospective members of the team. During Huggins’s tenure, more than 20 players had “significant encounters with law enforcement,” including accusations of driving under the influence, punching a horse, taping a roommate to a chair, burning said roommate with a heated coat hanger, and stabbing him in the leg. And only 28 percent of Huggins’s players (27 of 95) graduated, and in four seasons the team’s graduation rate was zero. We award Huggins’s student-athletes no points, and may God have mercy on their souls. But let’s not put all of the blame on Huggins, who resigned in 2005 after a very public drunk driving arrest. Before he arrived, Cincinnati committed major NCAA basketball violations in 1956, 1959, 1978, and 1988, and was hit with three separate postseason bans (something Huggins managed to avoid). And, the team you’re watching in this year’s tournament was involved in a nasty brawl with crosstown rivals Xavier early this year. Findings of major violations in 1956, 1959, 1978, 1988, and 1998. Violations: Booster run amok, benefits to recruits, lack of institutional control. Penalties: Five-year postseason ban, two-year television ban, nine years of probation. Memphis has had two Final Four appearances (1985 and 2008) stripped because of NCAA violations. The 2008 trip was vacated after the NCAA learned Derrick Rose had used a stand-in to take his SAT, and that Memphis had provided close to $1,700 in free travel to Rose’s brother, Reggie. After the 1985 season, then-head coach Dana Kirk was fired in the midst of a grand jury investigation that eventually led to an indictment on 11 counts of tax evasion, filing false income tax returns, mail fraud, and obstruction of justice. Keith Lee, the leading scorer on the 1985 team, testified that he had received $40,000 in illegal payments from Kirk. Findings of major violations in 1958, 1979, 1986, and 2009. Violations: Improper benefits to players and recruits, participation of ineligible players, lack of institutional control. Penalties: Three postseason bans, one television ban, seven years of probation, 33 regular-season wins and five tournament wins vacated in 2008, including appearance in national championship game, and nine tournament wins vacated from 1982-86, including 1985 Final Four appearance. The Wildcats received the “death penalty” in the 1950s and came perilously close to getting the full monty again in the 1980s after a slew of major violations. And UK is currently coached by John Calipari. It’s true that Calipari has personally managed to avoid NCAA sanctions, but he remains the only coach to have had Final Four appearances with two different schools vacated because of NCAA violations — Memphis in 2008, and UMass in 1996. Findings of major violations in 1953, 1976, 1988, and 1989. Violations: Academic fraud, coaches misleading and failing to cooperate with NCAA investigators, payments to recruits, and prolonged lack of institutional control. Penalties: Program shut down for one year in 1950s, one-year television ban, two-year postseason ban, five years of probation, reduction in scholarships, reduction in recruiting, two tournament wins vacated, return of revenue from 1988 NCAA championship. On the one hand, Syracuse only has one major violation. On the other hand, with the Bernie Fine scandal, coach Jim Boeheim’s initial reaction to the accusations, and a Yahoo! piece that reported the program was “awash in positive drug tests and, in many cases, failed to adhere to its internal drug policy while playing ineligible players,” we may be in the midst of our drop-the-coffee-mug moment with the ‘Cuse (and the Fab Melo team suspension over an “eligibility issue” isn’t helping with the trend). Findings of major violations in 1992. Penalties: One postseason and television ban, two years of probation. Findings of major violations in 1986, 1995, and 2005. Violations: Payment of extra benefits by coach, attempt to conceal information from investigators, instructing players to lie, failure to report banned drug use, extra benefits to players, unethical conduct, lack of institutional control, academic fraud. Penalties: Four-year postseason ban, two-year television ban, nine years of probation, reduction in scholarships, reduction in aid, decreased recruiting. JaVale! We Take It All Back!